All my life, I’d always thought of blueberry bushes as something you’d only plant in the countryside on a huge tract of land. The reality is that you don’t need a ton of space to get a ton of fruit. Our first attempt was a failure because we didn’t place them in the best spot. We planted them along the north side of our backyard, which gets about four hours of sun in afternoon. That’s definitely too little. One winter we decided to transplant them to our (full sun) front yard. We tore up a strip of law, moved the shrubs, and added about eight more 1-gallon plants that we bought for under $10 each at Home Depot. So far, soooo good! We selected varieties that would ripen at different times, and during the summers now we pick and eat from early May through July. We don’t spray the bushes at all and the fruit is delicious! 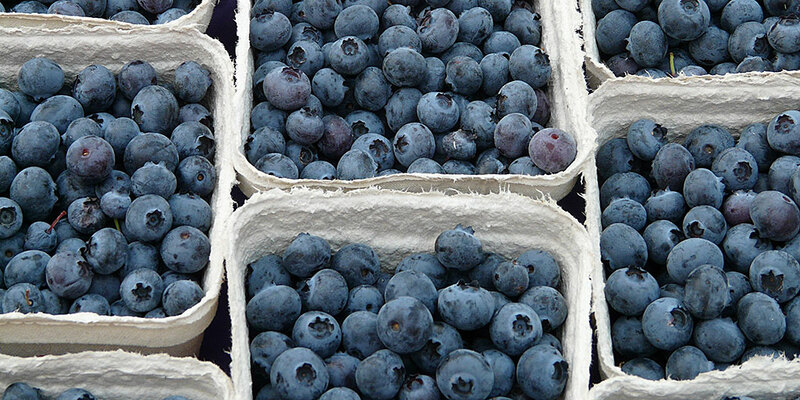 Tif Blue – Larger berries, lighter in color. They’re my favorite when it comes to flavor because they’re very sweet. The taste is mellow, and not very tart at all. Premier – Smaller berries, darker in color. They’re Aislin’s favorite because she loves all things tart. They’re also sweet, but the tartness is the dominating factor here. Becki Blue – Darker blue color that’s almost black, smaller in size. The flavor is very subtle but tangy; it has slightly floral undertones that reminds us of plums. 1. 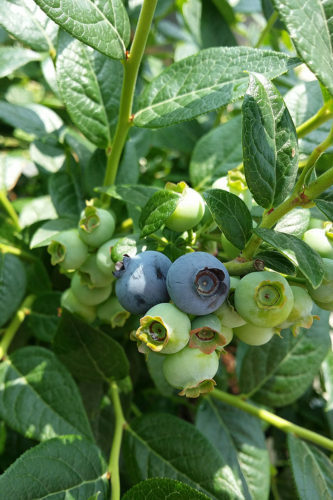 Blueberry bushes are low maintenance plants — but they need the right conditions to thrive. That means: full sun (six hours per day); water (especially when berries are forming); acidic soil (it’s easy to make the soil around your plants more acidic by doing things like adding sulphur dust; a soil test can tell you what you need); and fertilizer (I fertilize with organic fertilizer twice a year). 2. You have to choose varieties adapted to your climate. Blueberries need “chill hours” to produce fruit (i.e., a certain number of cold weather days), so here in the South where I live not all varieties will do well. I make sure to choose varieties that need fewer chill hours. Where I grew up, in Boston, the more chill hours needed, the better! A great way to find out which varieties tend to grow best in your area is by checking the website of the local university extension service. For example, here in Georgia I always check the UGA Extension Service website. You can easily find the one you need by doing a Google search. 3. You may need to be patient. Blueberry bushes grow fairly quickly, but they have to be a few years old to produce a decent amount of fruit. If you’re willing to wait a year before you see fruit, buy the cheapest 1-gallon or 1-quart blueberry shrubs. If you’re not, buy 3- or 5-gallon shrubs; chances are they will produce berries during that first summer. Larger plants can cost anywhere from $15 to $50 per plant. 4. You should cover the shrubs with netting in late spring and summer to keep the birds away. At first we set up temporary posts in the ground around the periphery of the bushes, and draped protective netting over them. It was a lot of work. Last year we simplified the process by draping the netting directly on top of the bushes. It worked just as well, though I suppose the birds could perch on the netting and pick away at the berries. The best defense is to keep bird feeders stocked with birdseed so they aren’t hungry. We also usually leave some berries on the bushes for them at the end of the summer. In winter blueberry plants lose their leaves and are very leggy. They can also get to be 15 feet tall. You can keep them trimmed to a nice, uniform height, but they don’t look great as a hedge. We planted ours about four feet in front of an evergreen hedge, so the blueberry branches don’t stick out visually so much. Old blueberry wood is brown; new wood is a pretty green. In early spring the leaves and flower buds start forming, then in later spring the flowers turn to green berries, which mature to blue. The shrubs can also be worked into a garden border with other plants, but it’s easier to cover them with netting if they’re placed together. Aside from placing them in a location where they will grow well, consider how your family will treat them (and I include pets in the family!). What you don’t need is someone accidentally knocking the delicate flowers and berries off of the stems by running between the bushes or tossing a ball on them. Also, if you plant the bushes alongside your lawn, make sure they don’t get sprayed accidentally when you treat the grass. To avoid this we switched to not spraying our lawn at all and it’s still thriving! It’s usually easy to find blueberry bushes for sale at a store like Home Depot if you live in a city. You can also get free shipping on most orders over $45! If you want to order them from Amazon, Daylily Nursery consistently gets great reviews. I’ve also had success buying strawberry plants from the Nourse Farms website and it’s a big blueberry plant supplier, too. The farm is located in western Massachusetts and is one of the highest-rated online sellers on Dave’s Garden, the popular gardening forum. 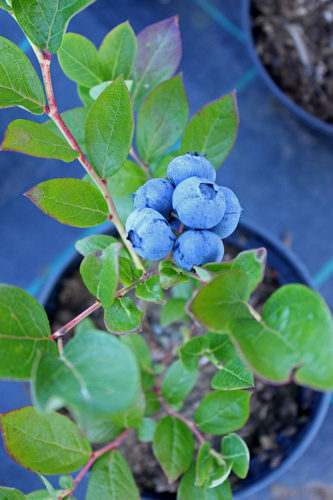 Do you have questions about how to grow blueberries at home? Leave a comment and I’ll answer it.